Oma Rosa Wehmeyer lived in this home until the late 1970’s. The front three rooms were built in 1911 and the other rooms added at a later date. Oma Rosa was known for her wonderful flower growing and flower arranging. The front porch has bent twig patio furniture and a porch swing. A step into the entry — is like a step back in time. The high ceilings, the light fixture, the hall tree and umbrella stand. The wood floors in the home have been beautifully kept along with all the woodwork. Rugs are place throughout the home to add warmth and colorful touches to the decor. There are two bedrooms, each beautifully furnished in antiques (queen-size beds) and floral comforters with coordinating linens and puffed valances. The den has a sofa — a wonderful way to watch TV or look out on the screened porch and at the yard beyond. 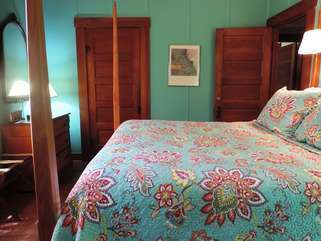 The home has two baths, each charming with embroidered pillowcases fashioned into curtains. The kitchen and dining room feature the original cabinets and built-in china closet. The dining table and benches are creations of a local craftsman (as is the four poster bed). The parlor is formal with its lovely couch, oriental rug, burgundy chintz valance and lace curtains. Oma Rosa’s Haus has been lovingly decorated with antique furnishings carefully selected to compliment this fine old home. The rooms are bright and cheerful and appointed with thought for the guests every need. Oma Rosa’s Haus is located three blocks from West Main Street in a older residential area. It’s within walking distance to the Fredericksburg Herb Farm. You cannot change the number of people during the course of your stay. We charge the highest number of people each night of your stay.